This page is devoted to our dedicated team of instructors. Over the years we have attracted very talented Instructors and our current team is no exception.We like to keep a very high ratio of staff to clients. We have learnt that we need to employ qualified and experienced staff in order to ensure that not only our horses but also all our riders are well looked after and receive the level of personal attention they deserve. All our instructors are CRB Checked and First Aid Trained. Proprietor of the yard Anitalea is a very talented instructor who holds her BHSAI. She has chosen to dedicate herself to teaching riders of all levels to become confident horsemen and women. She is a much sought after and popular instructor, who is as happy teaching beginners as she is helping riders to develop more advanced skills. Regular private slots with Anitalea whether in the arena or on training hacks, are much in demand. An excellent instructor who enjoys her work. They say Anitalea was riding before she could walk. Holds his BHSAI. He is our newest member to our teaching team. Chriss has settled in well and has fast establishing himself as a very good instructor to all ages and levels. 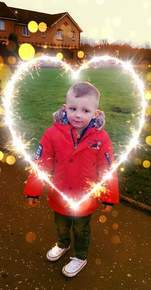 Chriss worked at the farm at the weekends and holidays living and breathing horses every second he could. He loves to compete at Show Jumping and One Day Events. Chriss can help you get the most out of your riding for competition or pleasure. He has proven to be very patient while encouraging when taking the rider to a higher level or riding. Congratulations to Chriss on becoming a dad to a stunning little girl called Charlotte on the 4th April 2017 8lbs 14oz. Best wishes from everyone. Holds her BHSAI. 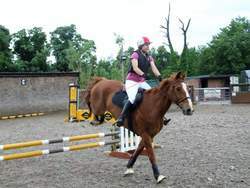 An experienced instructor who qualified at Foxley’s Riding Centre in Mount Vernon Glasgow. Anne has been teaching for 29 years, assisting people of all ages develop their riding skills. Deceptively quiet out with classes, Anne has the voice and the manner to take charge of lessons and ensure her pupils enjoy extending their abilities! Whether you are a 'happy hacker' or serious about your competing Anne can take your understanding and partnership to the next level. Anne is now also helping on the yard Tue, Wed and Thu 8-1pm helping with the daily duties and helping keep all our horses in their usual 1st class conditions. Holds her BHSPT. Lyndsay is a very patient instructor who especially enjoys moulding very young riders into confident riders. Lyndsay has a positive but gentle approach. Terri loves when new Riding School horses arrive at the yard. She loves the challenge of clipping, mane pulling and making our new horses look fabulous. Terri works her magic on Livery horses also and loves the shocked look of delight of the owner when they see the transformation. Terri is always available for help or advice on practically anything as she has proven she knows about horses. 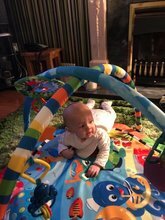 Staff and customers would like to congratulate Terri on the birth of another gorgeous boy and a little brother for Jay. 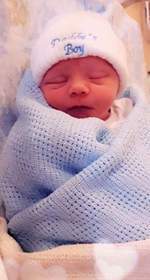 Rocco was born 20th Nov 2018 10.37am 6lb 8oz. Terri & Joe are so blessed to have 2 healthy handsome boys. Terri has now returned to the Farm but I am sure she misses this handsome boy every minute. 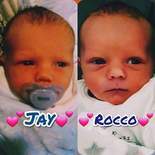 Terri will be going on Maternity leave at the end of October and will soon after be giving Jay a little brother. We will all miss her but as Terri has a love of horses I am sure she will still be visiting us with her new little bundle. We are very pleased to welcome Fi to our team of instructors. Fi has been teaching Freelance for many years and has proved very popular with our Liveries and customers. Fi enjoys competing with her own horse. Our newest member of staff. Rhiannon is 20 and has been with us for just over a year. Rhiannon has passed her Stage 1 and is working hard towards her Stage 2. Rhiannon always puts the best interests of all the animals first. She is animal obsessed. The staff call her DR Dolittle as you will find her always chatting away to a horse when she is working near them. Her people skills are second to none as she has a great relationship with staff and customers. Erin is loving working at the Riding School at the weekends. Erin knows the horses well as she keeps her own horse Charlie here. Erin is a very cheerful girl and is happy to take on any task whether it be tacking up, grooming or mucking out. Erin is always happy to help and especially enjoys when children come to have a Birthday Party at the farm. Erin loves to take Charlie Showjumpng where she recently got two 1st places in the 85 and open class at an event in Strathaven. Im sure Erin would live full time at the stables if she could so that she could be with the horses constantly. Brin is Bethanys horse and Brin also liveries here. Bethany has been riding for a few years now and likes nothing better than grooming and riding her horse. Bethany enjoys working at the Farm and I am sure you will see her taking Tiny Tot Rides and looking after the horses. Bethany is always keen to help anyone and nothing is to much trouble to her. Thanks to all our staff for contributing none of this would mean a thing without a dedicated, knowledgeable and passionate team to look after the horses, shop and office. We see ourselves as one big family, we work together and through choice we even socialise together. It is for this reason that Roundknowe Farm functions so well and that is the secret behind our success.